The resurgence of Cuba’s sugarcane industry in Cuba from its present abyss will be a contest for capital. Capital will flow to where it will have the most beneficial short-term impact: to the fields, to mechanization, to the mill. Can mechanical harvesting be part of the solution? This article discusses the challenges of introducing sustainable sugarcane production that would support mechanical harvesting and argues that sugarcane mechanical harvesting is essential for the Cuban industry to regain its potential. Much of the information used is drawn from the Farm Management Research & Extension, Department of Agricultural Economics & Agribusiness, Louisiana State University,2 and family business experience in at-risk sugarcane harvesting and transport. The information is shown in dollars per acres, hectares, and caballerías to make it more accessible to readers. Cuba embraced mechanical sugarcane harvesting in the 1970s, about the same time that most of Latin America and South Florida’s Everglades region did the same. By the end of the 1980s, Cuba had built in the eastern city of Holguín the capacity of producing 1,000 cane harvesters per year using Soviet technology. By the end of the 1980s, Cuba had a working fleet of about 5,000 self-propelled single row harvesters with 300 HP (horse power) engines. At the time that it embarked on mechanization, Cuba enjoyed heavy subsidies from the former Soviet Union. Even after the demise of the Soviet Union in the early 1990s, Cuba continued an unsustainable system of mechanical sugarcane harvesting with obsolete Soviet era equipment. Recently, Cuba has been receiving some assistance from Brazil with regard to mechanization. Although in the same geographic region as Mexico and Guatemala, Cuba is currently one-fourth as efficient in sugar recovered per hectare harvested as those two countries. At the present agricultural average of 32 sugarcane tons per hectare (ct/ha), mechanical harvesting is economically unsustainable. An improvement in yield of 2 to 2½ times is essential. Also essential would be reconfiguring furrow spacing, and width and length of fields and preparation of seedbeds, improvements that involve very high capital investments. With regard to the 2011–2012 sugar harvest, Cuba reportedly is planning to harvest 89% of the sugarcane with mechanical harvesters.3 However, the fields have not been modified to make mechanical harvesting more efficient. An example is a photo in an article published in the July 14, 2011 issue of the magazine Bohemia. As is evident in the photo (below), one line of the harvester’s wheels is in the furrow (zanja) and the other is riding on top of the seedbed (cantero), where sugarcane grows. The damage to the seedbed will start to show in the next harvest. Sugarcane mechanical harvesting requires very large capital investments in equipment and a strong service network, providing the “lowest owning and operating costs over the life of a product,” in the words of a Caterpillar Inc. spokesman distinguishing his product from that of his Chinese competitor in the U.S. market, Liugong Machinery Co. There is a slim chance that Cuba, with very little credit available and with a very credit-risk rating would be able to obtain the equipment and servicing from the Brazilian private sector in the magnitude that is required. Figure 1. Picture in Revista Bohemia article. Note: Left wheels are running outside the furrow. The first rule of understanding sugarcane machine harvesting is that machines do not perform on mathematically average conditions. They work only when certain minimum conditions are met, mostly very high sugar yield in the sugarcane per unit area. Because Cuba today has an average yield of about 30 ct/ ha and 2.5 total recovered sugar per hectare (TRSH),4 machines cannot harvest all the fields. Machines require fields with yields of 60 ct/ha or better in order to be able to operate efficiently. In fields with lower yields, machines come to a sudden stop, requiring frequent stops and lowering efficiency.5 It should be noted that where due to climate conditions sugar yields are low—for example, Florida, Louisiana, Venezuela and Northeast Brazil—this has an impact on the bottom line, but not sufficient to deny the contribution of the benefits of mechanical harvesting. At the end of the day, the machine survives on sugar in cane delivered, and not per area harvested. 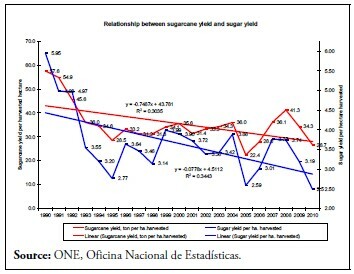 If the loss in agricultural yield is great, greater is the loss in recoverable sugar, as Figure 2 shows for Cuba over the last 20 years. The business is the production of sugar, not sugarcane, sugar brought in the cane from the field to the mill. Note that the proportional loss in sugar recovery is bigger than the loss in sugarcane yield. The smart path for the development of the Cuban sugarcane industry in the future will be one that facilitates and provides the environment necessary for (1) the best credit risk, (2) the lowest interest, and (3) the most favorable environment for foreign direct investments. Modernization of Cuban sugarcane production can be the most expensive of all sugar industry-related investments and at the same time potentially the most financially rewarding. To get a sense of magnitudes, below are some statistics on the 1990 harvest, the largest on record, considering sugar international prices at the current value of about 25 cents per pound. Horsepower for field work: 4 million engine HP’s. Historically, the 1.4 million ha of sugarcane lands in Cuba would be valued at $5 billion.6 The value of sugarcane lands, and the return on investment that can be delivered, is the ace in the hole for the Cuban industry. Only a stable political and economical environment can make the necessary returns possible, however. In rough terms, to sow, plant and care for new fields to first harvest costs $3,400 per hectare; the investment for a machine harvesting fleet including tractors, trucks and trailers, without shops and storage, around $2,000 per ha harvested. The mill’s investments to operate at close to rated capacity depends on each case in particular, but will be ignored here, because once you have the field and cane deliveries solutions, financing upgrades and repairs are standard in any industry once you have your raw material secured. Removing the fleet from the capital requirements makes the search for planting capital a lot more practical. Financing of planting operations is commonplace everywhere, except in today’s Cuba. Payment is based on sugar and prices. Direct expenses are relative to distances traveled and fixed expenses are depreciated based on hours of operation. A $238,000 sugarcane harvester has, in the LSU-Ag study, a fixed cost of $22,000 per year, and $51 per hour in direct expenses, based on 700 hours per year, $36,000, for a total of $58,000. Equipment leasing could be part of the solution to mechanical harvesting in Cuba if the capital requirements could be leveraged with the standard tool used in businesses: lease, even better, a performance lease, like a contract at-risk (see below). Many large trucking leases in the United States are based on fixed rates per ton-mile, plus variables like diesel fuel. A handful of world class players have the capital required: engine manufacturers, like Cummings, Detroit Diesel, Caterpillar, and equipment-lease-contractor giants like Ryder and Penske. In 1979, my father and I partnered with Miami’s Casper Engineering to form Cane Harvesting Consultants and Suppliers Inc. (CHCS), a corporation registered in the State of Florida. That year we entered into a 5-year contract for sugarcane harvesting and delivery to the Portuguesa mill in the State of Acarigua, Venezuela. The mill owned an abandoned fleet of 10 TOFT MKII harvesters and support trucks, tractors, trailers, offices and a shop. The contract was “At-Risk,” based on established rates per cane ton and distances to the mill, less fleet lease payments. The results were modest principally because the mill did not provide a dedicated path for mechanically harvested cane to avoid delivery delays and the mill suffered from mechanical breakdowns which made it practically impossible to keep the harvesters continuously in operation. Effective machine time is the limiting factor to measure the harvesting system sustainability. At-risk contracts for sugarcane harvesting are not attempted anywhere in the world unless yield is higher than 2 to 2½ times Cuba’s present yield of about 30 tons of sugarcane per hectare. For one sugarcane machine harvester, minimum year production of 25 thousand cane tons in 80 ct/ha fields requires 770 acres, 313 ha, or 23 Caballerías. Each harvester’s support equipment, including the harvester, tractors, trucks, and trailers and support, require an initial fleet cost in the neighborhood of $1 million ($3,200 per ha, $1,300 per acre, or, $43,000 per Caballería). Agricultural yield in terms of sugarcane tons harvested per unit area, ct/ha cane tons per ha, is not the practical system to determine economic results. In Brazil, for instance, the payment for sugarcane is based on chemical analysis at delivery to determine availability of sugars for the industrial process. The price is determined by end-product factors, lower for sugar and higher for ethanol, reflecting the processing cost of each. Market price averages are reported by a mutually accepted evaluator. In the case of the majority of Sáo Paulo State, the evaluator is CEPEAESALQ- USP.7 In the LSU-Ag study case, the references are to sugar (pounds) yield per area harvested. In my opinion, the best indicator is the amount of net sugar recovered per unit area, the figure ultimately used in settlements of wages, contracts, and others. When this is done in metric tons of sugar per hectare, 8 the results are easy to understand. Cuba currently can recover 2.5 tons per hectare and Guatemala 12 tons. The 1,000 acre farm in the LSU-Ag study averages in 6 crops from the same seed, 7.5 sugar tons per hectare. Cuba in the 1950s had cane yield averages of 42.5 ct/ha and industrial yield of 12.5%, equivalent to 5.3 sugar tons recovered per ha. Five years after the reconstruction of the Cuban sugarcane sector, 7.5 sugar tons recovered per hectare would be a good objective. But as a note of caution, as we will see below, mechanical harvesting costs are directly proportional to distance traveled. A 30 ct/ha field requires 3 times the direct variable expenses9 of fields of 90 ct/ha. Even fixed production expenses, like depreciation, are directly linked to engine hours of operation. A sugarcane hectare has about 5.5 lineal kilometers (3.5 miles) to be harvested. In high density fields (of 90 tons of sugarcane per hectare), the consumption is 60 gallons of diesel according to the LSU-Ag study; in 30 ton fields, the travel distances are triple and consumption is 180 gal., as well as other direct and indirect factors that are relative to equipment distances traveled and engine time. In South Florida, harvesters are mostly owned and operated by the mills as are also tractors and trailers; tractor-trailers for the delivery to the mill are outsourced. In Louisiana, harvesters are mostly owned by farmers and deliveries are outsourced. a. The mill is contracted by the farmers for the full service. b. Independent contractors conduct harvesting and transportation services. c. Condominium, as the Brazilians call it when a group of farmers has full harvesting capabilities. The cost of harvesting in Cuba after the official end of slavery in 1886 went from best practices—the piece-work settlement in sugar equivalent incorporated into statute by the Ley de Coordinación Azucarera (LCA) of 193810—and then by the way side with the present regime. Everywhere, clean, cut, transport (CCT) is based on the price of sugar, approximately 32%, of the sugar share of 50% the farmer receives from the mill in payment for furnishing the raw material. The LSU-Ag study (Table 16.A) lists costs of $241.32 per acre for a harvester 1–row combine, 10– ton high dump wagons, custom truck trailer haul, equivalent to $584/ha, in 75 ct/ha fields, or $7.80 per cane ton. Labor is only 15%. In Cuba’s present situation, with TRSH at 2.5 compared to Louisiana’s 7.5, the cost factor is 3. Cuba’s attempt to mechanically harvest crops at 3 times the $7.80 per cane ton, is $23.4 per cane ton, a cost that is unsustainable. The main challenge to lifting Cuba’s sugarcane industry from the current abyss is not technology, lack of experience, soil compaction or salinization. The challenge is financing. To attract offers, the magnitude has to be sufficient to attract engine manufacturers, bankers, capital markets and leasing companies. This article establishes that the size of the Cuban market would be attractive to potential businessmen and investors. As an interesting example, the parent company of American Airlines, AMR, is seeking to replace the airline’s entire fleet with $13 billion in lease financing for equipment from Boeing and competing Airbus, without raising capital of its own to pay for the new planes. Applying this example to the Cuban situation, the Cuban fleet for sugarcane harvesting and delivery is estimated in this article to require an investment of close to $2 billion, with a total of 4 to 6 million in engine HPs. Yearly revenue for the sugarcane harvesting contracts could reach $1.2 billion. When the conditions are appropriate, one of the earliest steps will be to prepare Request for Proposals (RFP) for the fleet. The strategy will be to limit the RFP to a handful of world-class engine manufacturers and equipment leasing giants. The engine manufacturers have the single biggest piece of the investments. 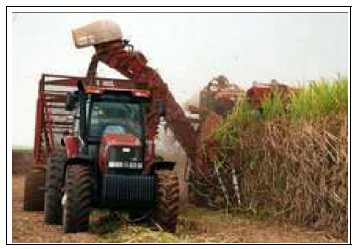 A sugarcane harvester is essentially a tractor with multiple hydraulic arms, cutters, elevators, conveyors and blowers. Hydraulics are relatively simple to maintain. But a 350 HP Diesel engine is a complex piece of equipment that requires volume incentives to create the required support network of distributors, dealers, training facilities, and stocks. Trying to invite everyone to the party will only create supply-chain headaches. They will follow on their own. Leasing with full-service maintenance for single source responsibility is probably the quickest and most practical solution for a quick liftoff of the sugarcane industry given the swiftness with which outcomes can change. When a major change in Cuba’s politics and economics take place, there will ensue a rush of interest in investment in the island. The sugarcane industry, as it exists at the moment, will get off to a very bad start and will have to play catch-up. An important element of the recovery of the industry will be outsourcing mechanical harvesting and delivery of sugarcane. 1. Comment by G.B. (Jerry) Hagelberg (1925-2011) at the August 2011 meeting of ASCE. This paper is dedicated to Jerry, the best friend of Cuban sugar. 2. Particularly relevant is Salassi, Michael E., and Deliberto, Muchael. Louisiana State University Farm Management Research & Extension, Department of Agricultural Economics & Agribusiness. 2007 Projected Commodity Costs and Returns. Sugarcane Production in Louisiana. A.E.A. Information Series No. 245. January 2007, cited henceforth as LSU-Ag. www.lsuagcenter.com. 3. Juan Varela Pérez,”Cortarán el 89% de las cañas con máquinas,” Granma. 17 de agosto de 2011. Figure 1. Picture in Revista Bohemia article. Note: Left wheels are running outside the furrow. 4. TRSH is calculated as the product of agricultural yield and industrial yield, expressed in terms of tons of sugar recovered per hectare of harvested land. 5. I know this from personal experience, when I tried to negotiate the 30 ct/ha to get the 90 ct/ha farms, and regretted it every day. 6. The average price of idle sugarcane lands in 2004 Brazilian in the remote State of Minas Gerais was $3,725 per hectare, $1,540 per acre, $50,000 per caballería. At this price, the inventory of 1.4 million hectares of sugarcane lands in Cuba would be valued as much as $5.2 billion. 8. Sugar recovered is the product of sugarcane weight and industrial recovery. Say, 80 ct/ha X 13.5% = 10.8 sugar tons per hectare. 9. Direct expenses are fuel, labor, repairs, maintenance, and field support for water, fire protection, and lubrication. 10. For a discussion of the LCA and an overview of the payments to workers and growers (colonos) in Cuba under this law see, e.g., Juan Tomás Sánchez, “La reconstrucción de la industria azucarera cubana,” Cuba in Transition—Volume 13 (Washington: Association for the Study of the Cuban Economy, 2003).